Tree Top’s internship opportunities enable you to use what you’ve learned, expand your knowledge and benefit from invaluable on-the-job experience. They’re a great way to explore the career choices that lie ahead of you. Use our internship program as a gateway to explore job opportunities with Tree Top after graduation. Completing the internship program does not guarantee you a job upon completion. Internships generally last up to three months. Start dates for interns will typically be May/June; however, the start date can vary depending on the school requirement and department need. 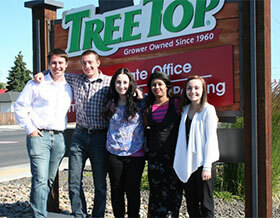 Each year, Tree Top will select five (5) interns, based on the company’s needs. What has been the effect of this internship on your career goals? Would you recommend Tree Top as a place to intern? Interns are paid an hourly rate during the entire internship. Tree Top’s internship program is for students who are at least eighteen (18) years of age or older at the time they begin the program. Candidates must be eligible to work in the United States and will need to provide proper documentation on your first day. In addition, candidates must be enrolled at least half-time in an accredited college or university as undergraduate, graduate, or professional students, or as a student at an accredited technical institution. Two professional letters of references (i.e., professors, counselors, prior employers, etc.). Interviews are typically conducted in March. Selected interns will be notified by end of March or early April. To view our Internship Opportunities, visit our Current Openings page and look for “Internship Opportunities”.